A new garbage compactor has been added to the San Pedro Sanitation Department fleet. It is the first of four garbage compactors that the San Pedro Town Council (SPTC) is acquiring as it attempts to keep up with the increasing garbage being produced on the island. It is expected that with the addition of the compactors the sanitation department can be more effective. On Tuesday, April 19th, Mayor Daniel Guerrero and Deputy Mayor Gary Greif were on hand for the unveiling and handing over of the first compactor. Top authorities at the SPTC indicated that it would be put to use immediately. Greif acknowledged the great work of the SPTC staff in the acquisition of the garbage compactor. “I applaud our staff, and in particular, the dedication of Councillor Ruben Gonzalez, who is in charge for tax and revenue collection. Thanks to his commitment and ensuring that all relevant fees were collected, we were able to allocate funds for the first compactor,” said Greif. He also took the opportunity to remind residents of the importance of paying their dues to the Town Board. He emphasized that all fees collected are put back in the community in a range of different projects with the sole purpose to benefit every individual on the island. Another plan that the SPTC has in store is addressing the inadequate management of garbage. “The idea is to also target the sources of garbage and not just keep up with the increasing amounts we have been dealing with. Yes, we put more infrastructure in our sanitation department, but at the same time we need to tackle garbage itself so it does not become an overwhelming situation for our labour force and resources,” said Greif. 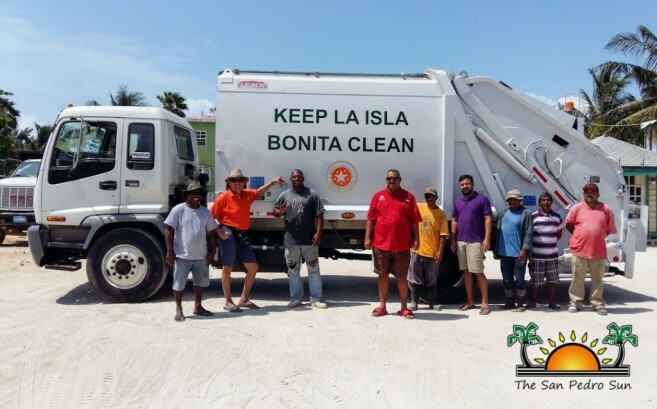 He plans to team up with the island’s Health Inspector and come up with an educational campaign for businesses only, which will provide them with information on how to properly handle garbage. The campaign will touch especially on the bagging and storing of trash, which will make collection easier with minimal probabilities of any misplacement. Currently the SPTC counts with only two garbage compactors. It is expected that by the time the fleet is completed, the sanitation department will have a total of six. In addition, two more dump trucks will be added to the fleet to enhance its performance. Container full of garbage tips over! Clean up, clean up, everybody clean up!